Save all of the image files you want to add to your gallery in one folder either on the Desktop or a folder you can easily browse to. Click on Galleries in the top navigation bar under the Omaha Artists Inc. logo. Under Galleries Menu on the right side of the page, click on Manage Gallery. (See Access Your Gallery for details). You should see something similar to the image below with your name where "Your Name" is in the image below. Click on the Add Files button to browse to the folder that contains your gallery images. Select the files and click on the Choose button or drag the image files from the folder on to the window. Your files will be listed in the window. 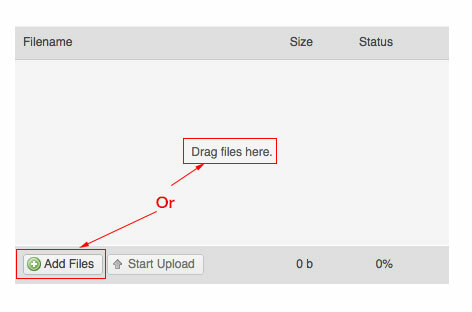 If you see files you do not want to upload, click on the red circle on the right side on the same line as the image you want to delete. If you are missing a file, click on Add Files to add it or drag the missing file over from the folder it is in. Click on the Start Upload button. You will see a progress bar as image is uploaded. The window will clear and you will see a table of your images that has icons/links to let you add descriptions and change the order they will appear in. 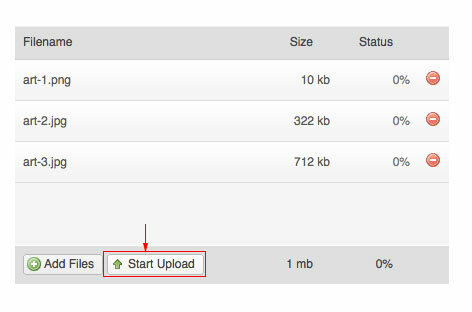 After uploading your images, the Manage Images page should have a table of images similar to the image below. To add or edit the description for an image, click on the Edit link to the right of the image. Refer to the image below for the remaining steps. In the Description editor box, add the title and medium used. The rest is up to you. Click in front of the title to place the text cursor and click on Styles menu in the editor menu to see the drop down menu and then select Gallery: Title. Select the remaining text and choose Gallery: Description from the Styles drop down menu. Click on the Save And Next button to save the description for the image and to open the description area of the next image. Repeat the same steps for each image. You will be brought back to the view of all your images after you have saved the last image description. You will also be brought to this view if you choose Save & Close at any point.